The head of the Thunder Bay Drug Strategy calls the number overdose deaths in the city staggering — one reason why the city has announced a new overdose prevention program. The head of the Thunder Bay Drug Strategy calls the number of overdose deaths in the city "staggering" — one reason the city has announced a new overdose prevention program. The program trains users how to spot the symptoms of an overdose and to administer Naloxone, a drug given by injection that reverses opioid overdoses. Cynthia Olsen said it's an important step in reducing the drug-related deaths, which she said outnumber deaths from motor vehicle collisions in the northwest. "So it's pretty significant and — when we can put this medication in the hands of people who are often first to see it — that can make a big impact on those numbers," she said at a news conference on Monday. Olsen said training — and the Naloxone kits — will be provided by staff at the Thunder Bay District Health Unit. The training will also inform users how they can help themselves, Olsen said. "So, not mixing substances [and] not using alone," she said. "If they switch a substance, to make sure maybe they test it a little bit before ... like use a little bit, 'cause you can never kinda undo what you've done." The program is aimed at people with a history of opioid use and abuse. "Anybody who's using an opiate is at risk of overdose," Olsen said. "So we want to engage those individuals to come, be willing to take a training program that will be about 45 minutes to an hour [in length]." This is the second Naloxone-based program to start in the northwest. The Northwestern Health Unit in Kenora launched a similar program earlier this year. 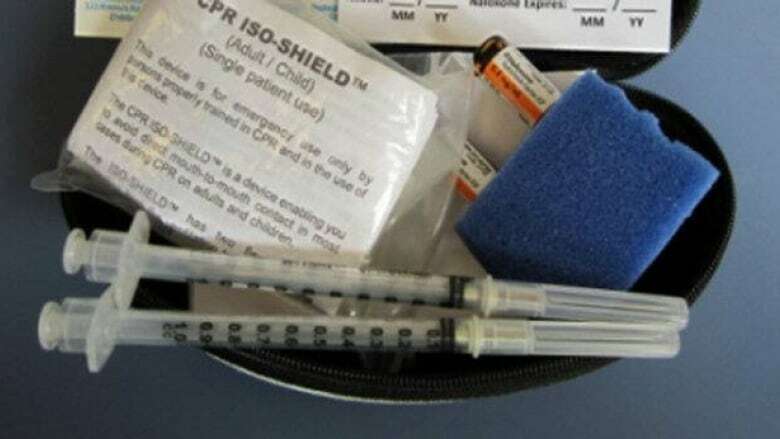 The Naloxone injection kits and the training materials are funded by the province , while the Naloxone vials are being purchased by the Thunder Bay health unit.